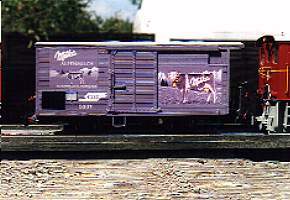 I began my modelrailwaycareer with a TRIX-EXPRESS - a german modelrailway manufacturer with a special 3rail-system - HO-scale "layout". The next step was at the beginning of the 70's a N-scale-layout. In 1979, I changed to HOn30. 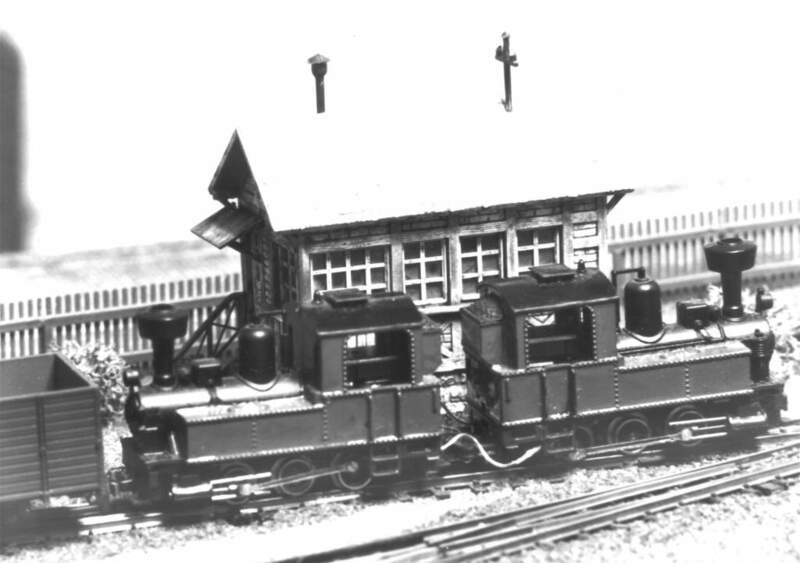 In spring 1979, I foundet together with some friends our local modelrailway-club, the Railwayfriends Werl. In winter 1980/1981, I started the construction of a segment layout - not modules - in HOn30. The goal was to participate at the next exhibition in april 1981 in Dortmund, Western Germany. This was the start of the Westoenner Kleinbahn "WKB" (Westoennen short line). 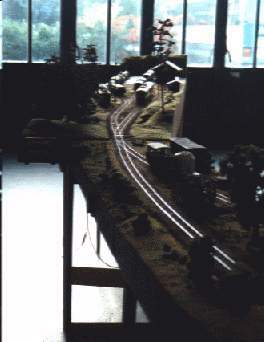 This segment layout, which was with landscaping during his whole life only on the station-segment, was shown on the modelexhibition in Dortmund in 1981 and 1982, and also it was shown during our club-exhibitions. 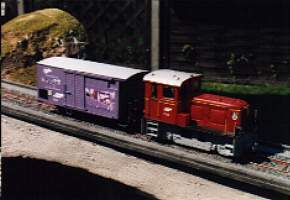 I was cofounder of the narrow gauge association "Arbeitsgemeinschaft Schmalspur" in 1983, and following I changed to Sn39 1/4 (european metergauge). During the next years, I tryed to model in O-scale wide gauge (standard gauge) and also a garden layout in G-scale. In 1986, I started my first module in On39 1/4 for our fallmeeting of the Freundeskreis Schmalspurbahnen Kiel (circle of narrow gauge friends) in Kiel, Western Germany FKSB. In Kiel I heard, that one member of our group had cancled the hobby and his station was not langer available. Because I promised a complete On39 1/4 modulelayout to my local modelrailwayshop for his fallexhibition, I constructed on two modules, I owned without any landscaping or track on it, a complete station with a maintrack, a siding and two yardtracks. I had only four weeks for this hard work, but I finished it at the deadline of 1/2 hour before starting to build up the module-layout. There was not only the track and the ballast on the module, there was also some landscaping. I completed this modulestation with a little bit more landscaping, the toilett-building, the depot-building and some more modules. With this collection of modules, I was together with my friends during the next years on exhibitions and meetings not only in Germany, also in Austria to find. In 1990, there were some quarrel in our group, and following I cancled my active career with journeys through whole germany and took my stationmodule into my stationary layout in my layoutroom. I changed my track on the module, so that the mainswitch was on the stationary part and not on the module. With this changing, the modules were not longer available for modullayouts. After refounding of the FKSB I reactivated the modules of my station. My good friend Georg Wolter from Bonn reconstructed the complete landscaping and constructed a new module with the mainswitch, so that the modulearrangement could connect to other modules. In this version, my station arrangement was shown during the FKSB-fall-meeting in 1995. For the fall-meeting in 1996, there was a special module for the end of my station created. But than, we signed and participated at the Hamburger Modellbautage in November 1997. Now, we will do the reconstruction of the modules, and for this show, I've built in the meantime a small-billboard-boxcar. The WKB has her own layout room. Because this room is only 13 ' long and 7 ' wide, I only can use both main stationmodules. After leaving the station, there is a 180 degree curve with a radius of 39 1/4 ". 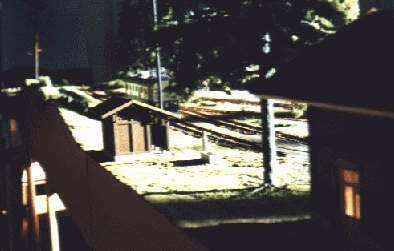 The next is a small station with a short yardtrack, and than the train passes a removable part. 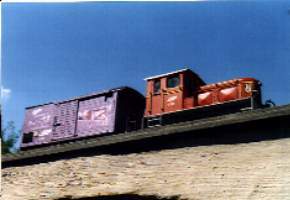 After passing this section, the train reaches the endstation, a small fiddle yard. This room is 5 ' long and 7 ' wide. The theme of my WKB is a narrow gauge line in the alpinemountains in the eastern part of the swiss. In my fictive world, there are connections between my WKB and RhB in the near of Tiefenkstel. My railway starts in direction to the Juliermountain and will get a tunnel under this mountain to reach St. Moritz. Also in my fiction, there is a connect between the FO (Furka-Oberalp-Railway) and the MIB (Meiringen-Innertkirchen-Railway), and also a line between Innertkirchen-Ost (SBB) and the MOB (Montreux-Oberland-Bernois-Railway). With this connections, there are most of the narrowgauge-lines in the swiss connected. The rolling stock of my layout is collected from prototype railways all over the swiss. I search everytime for small engines and cars, which I can use on my modelrailway. For the next years, I plan to connect a garage in the neighbour of my layoutroom with my layoutroom. Then I will be able to construct a bigger On39 1/4 layout, and also a On3 layout. On3 should be on the upper deck, and On39 1/4 on the lower deck. 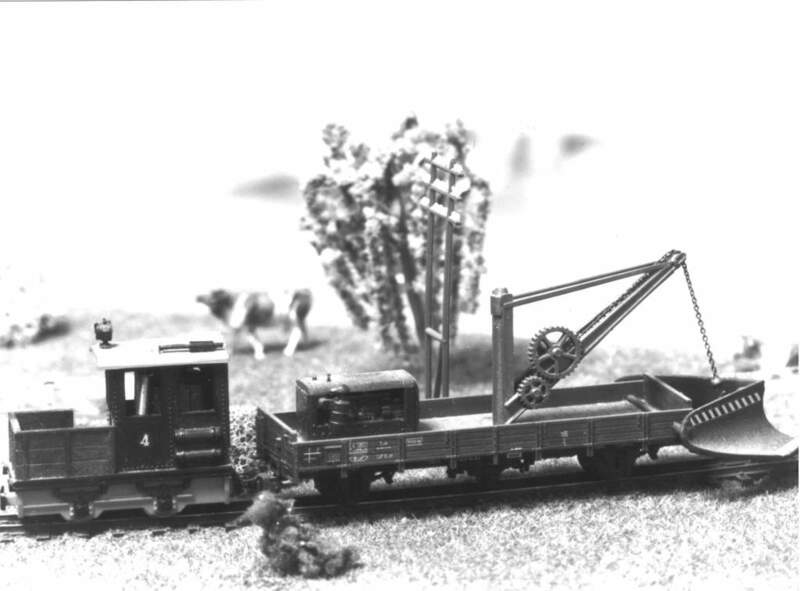 Another love in my modelrailroadlife is since 1998 the narrow gauge in 2.5" / 3" scale on 7.25" track. For this, I built in fall/winter 1998 a 30" prototype freelance-critter. In the meantime, I cancled all the memberships in modelrailroad clubs and I'm only an active member at the circle of narrow gauge friends Kiel.